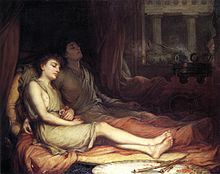 In Greek meethologie, Hypnos (Greek: Ὕπνος, "sleep") wis the personification o sleep; the Roman equivalent wis kent as Somnus. ↑ ὕπνος. Liddell, Henry George; Scott, Robert; A Greek–English Lexicon at the Perseus Project. ↑ James H. Mantinband. Concise Dictionary of Greek Literature. New York: Philosophical Library, 1962. This page wis last eeditit on 24 Julie 2016, at 01:16.